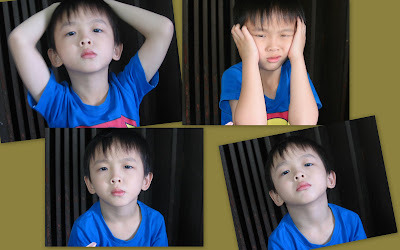 These photos took at the Gurney Drive (just in front of the hotel ) in the morning ..
- We stayed at a 2 bedrooms suite, consists of a living room, one master room with jacuzzi, one double room and a pantry. This room is very spacious and roomy. 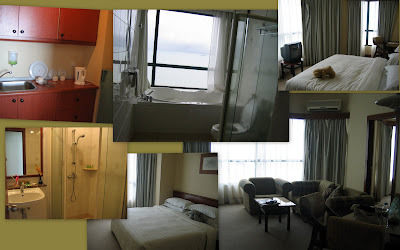 - Swimming pool located at 7th Floor, able to enjoy full view of Penang sea.. I attended a cooking demo session at my husband's friend house the other day, the main purpose was to promote induction cooker. They use the induction cooker to cook this dish, and the taste was great, so I would like to share this simple recipe with you. It taste like salted chicken with full aroma of lemongrass and wine ..
- Add some Chinese wine ( Tiew Heng wine), and wrap the foil neatly. I use oven to bake instead of using induction cooker, bake at pre-heat oven for 30mins at 200c. Just back from Penang after a short trip 3D2N, it was a last minutes decision, decided on last Sat, made the hotel booking, and headed to Penang on last Sun. We went to Hock Chuan Heong Restaurant to have our lunch on the 2nd day, I knew this restaurant via Big Boys Oven blog..as usual, I gave a try since he said here served the famous authentic Hokkien cuisine called Zhu Cha (Chinese dishes)..
Look at the address, it look simple to locate, but in actual fact we drove Pengkalan Weld street twice also couldn't find this restaurant. Luckily we saw a postman and ask him for the location, he was so kind and ask us to look for apartment (no 344 , and there is a mini Post office at the ground floor) but not coffee shop nor restaurant..So next time if you have lost direction, the best person to guide you will be a postman, hahaha..
- very "old fashion"古早 of bowl. - 古早味 Hokkien braised noodle, this was good, yellow noodle cooked with pork slices, internal parts, cuttle fish and prawn, full of "wok hey". Desmond had two bowls of this..
- we all love this dish, Char Tao Kua (Stir Fried Tofu with Leek), simple combination fried tofu, fresh prawn and leek. This dish is full of "wok hey" and 古早味..
-this is Bak Kee (pork slices soup), for us, it just normal, fry pork slices which coated with tapioca flour (we feel that they coated with too thick of flour), and they added too much of pepper and also the soup is quite oily (because they fried the pork slices before add into soup). We also ordered Char Oe Chia (Pan Fried Oyster Omelette), but have to "tapao" pack back to hotel because we were too full as all dishes served are very big portion. Anyway, I would suggest you to give a try if you happen in Penang, a very 古早味 (old fashion style) of restaurant, and would suggest you to order normal stir fry dishes e.g like sweet and sour fish, tofu, veggie & etc..and try to go there during off peak hour..Thanks Big Boys Oven for good recommendation. Do enjoy eating out !!! I got these donuts free from "Big Apple Donuts", how I got it free? You need to bring the cut out coupon from newspaper and be the 1st 100 persons on their 1st day of opening ceremony, then you entitled to get 6pcs donuts for free. Since this newly Big Apple donuts cafe (Klang Parade) just nearby my house, so this was my 1st time to do this kind of " 师奶" job, queue for 30mins to get donuts free, and thought this will be my last time, very "师奶", won't do it again, hahaha ...Anyway, Thanks to Big Apple Donuts..
** photos taken using my phone... sorry for poor quality of photos.. When I baked the Char Siew bun the other day, I bought more Char Siew to fry rice for dinner as well, and also because recently just watched a TV show teach on how to cook a good Char Siew fried rice. 1. Heat oil in a wok, saute garlic until golden brown, dish out and set aside. Use the remaining oil, crack eggs into the wok, scramble until just cooked. 2. Add in chopped Char Siew (BBQ meat), and cook for a while. 3. Put in the rice and toss to combine. 4. Add seasoning, fried garlic and fry well to combine. 5. Dish out, sprinkle spring onion on top and serve immediately. Do enjoy fry rice !!! The other day I saw Rachel making 烧包 (original recipe from My Kitchen Snippets), this remind me the Char Siew bun that I tried earlier, it using the same Char Siew filling but wrap with sweet bread dough, usually it wrap with normal pastry skin or pau skin..
- Asked Desmond to become model to hold the bun when photo taking, I couldn't get a clearer picture, as his hand keep shaking and he keep saying his hand pain, actually he wanted to watch his favorite cartoon..So I managed to get this photo..
- failed one, too thin skin, resulted filling came out..
1. 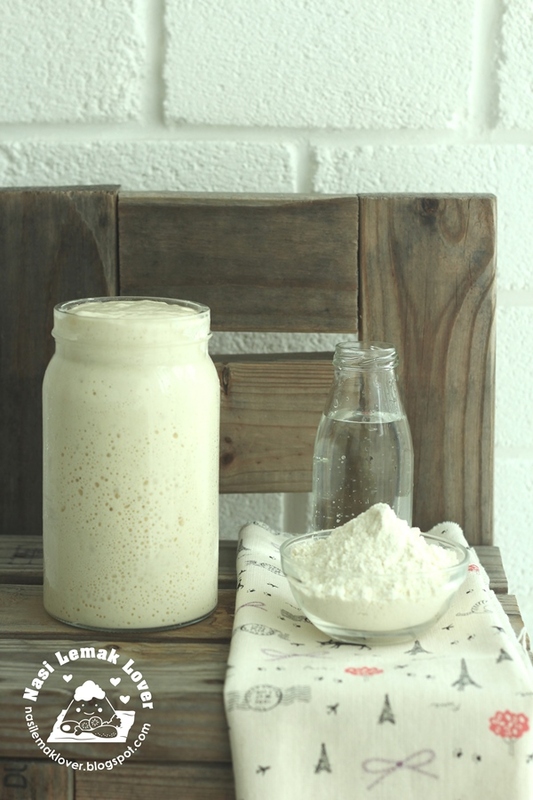 Mix all above ingrediants and knead became dough. Set aside for 30mins. Then put into a plastic bag and store in the fridge to keep it overnight. 1. Mixed all ingredients except butter, knead and mix well. Then add in butter, knead until smooth. 2. Set aside for 60mins. 3. Shape it and put in the filling and bake for 25mins at 180c. -200g Char Siew (BBQ meat), cut into small cube. -1 big onion, cut into small cube. 1. 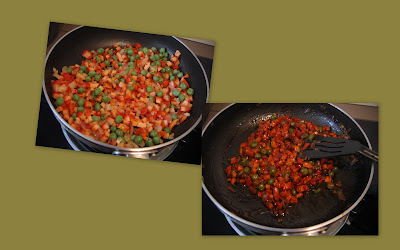 Heat oil in a wok, stir fry onion, add in BBQ meat and green peas, add little water. 2. Stir fry for a while, add seasoning, and thickening the gravy by corn flour water. ** Bread add in 中种面团, still soft even keep it overnight, but just a bit "leceh" because you need to prepare one day ahead..I will try another method "water roux" soon. I like to eat anything cook with glutinous rice, Seri Muka is one of my favorite. My sister in law Annie so kind sharing the Seri Muka recipe. This was made much earlier, but wait until now only got the chance to publish it. - Mix half of the rice with Butterfly Pea Flower (Bunga Telang)**optional..
-2 pieces pandan leaves, knotted. 1. Put all the ingredients into a steaming tray. Steam with high heat until cooked (about 45minutes) .Discard pandan leaves, fluff up rice and press with banana leaf until very firm. Top layer-1 packet Hoen Kwe Flour (80g) ** I bought green colour HK flour. 1. Put the HK flour, custard powder and sugar into a mixing bowl. 2. Add in the coconut milk and stir till sugar dissolved, add in the pandan juice. 3. Strain the mixture into saucepan, keep stiring with low fire until thick and smooth. 4. Pour the mixture to the bottom layer, steam for about 15 - 20 minutes until cooked. 5. Remove, cool before cutting. Nowadays children are so lucky, when comes to their Birthday, they will ask you to bring them for a good dinner. 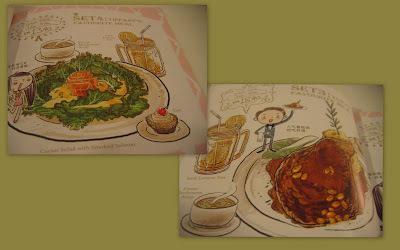 This time, I brought her to this restaurant which I just recently knew via Ai Wei's blog. This restaurant is hottest restaurant among blogger..I noticed a lot of youngsters carry sophisticated camera shot here and there, I guess they all are blogger... I realized I'm the oldest blogger among them !!!! -As usual, I bake a birthday cake for her, pandan layer chiffon cake, very ugly decorated..paiseh..
- very cute comic strips menu..
-They even print the recipe on the menu, amazing..
-How could you resist to enjoy dinner with comic drawing on the wall..
- Not much of choices in the menu, this is good for me, if too many, I will headache what to choose..
- Set lunch, very reasonable price, about RM 12.90 - RM 18.90, consists of main course, drink and soup. 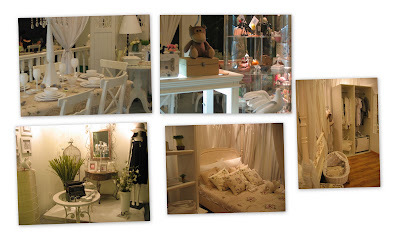 -Few of the corners at this restaurant, you can also do shopping here, clothes, shoes, accessories & etc are available. 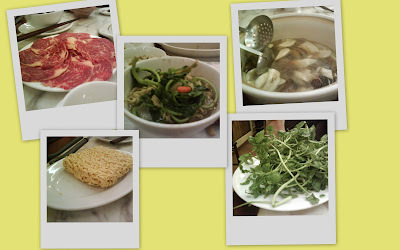 When my husband said his counterpart recommended us to eat mushroom hotpot, my 1st reaction was " Can eat one or not? mushroom steamboat,no no, I still prefer to eat Vietnamese foods" , but last, I still forced to go Ashima mushroom hotpot restaurant and really had no expectations. Luckily I go otherwise I will miss this interesting and delicious mushroom hotpot. 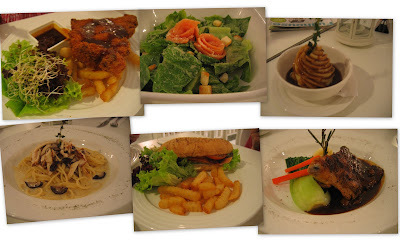 You'll be amazed by how many different kind of mushroom offered on the menu, and it will be overwhelming. If you are 1st time here, you can ask for recommendation from the staff. We choose chicken & Chinese herbs broth, since only two of us, we just ordered beef, veggie and instant noodle (this is good).